Thanbyuzayat War Cemetery, Plot A5, Row G, Grave 14, Age 28. Shell shocked at Buona Vista on 15.2.1942 but remained on duty. Soldier marched into Shimo Sonkurai with malaria and dysentery but recovered well. Captain George Gwynne spoke to soldier on his way up to Tanbaya in Burma. 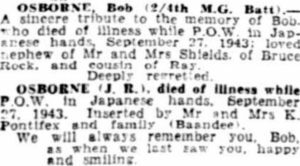 At the time soldier was at Kami Sonkurai (24.8.1943) and Captain Gwynne recalled that he appeared to be well. Above: Neices Lisa and Rosemary attended the 75th Service for the Fall of Singapore held Sunday 12 February 2017. 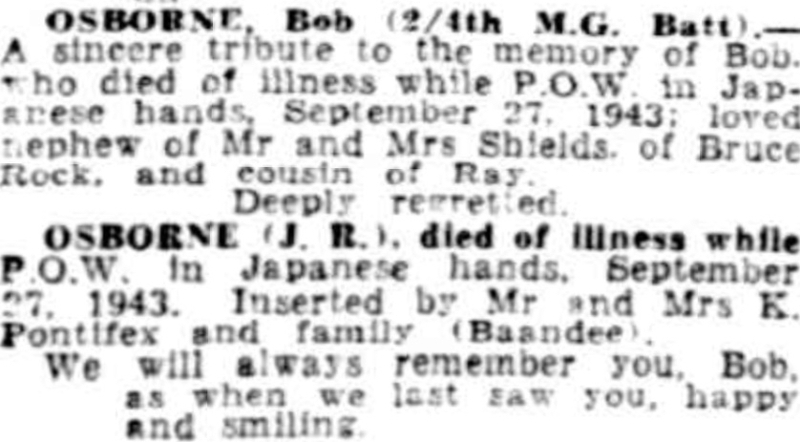 Their uncle John aged 28 years, died 27 Sep 1943 of pneumonia, Kami Sonkarui. 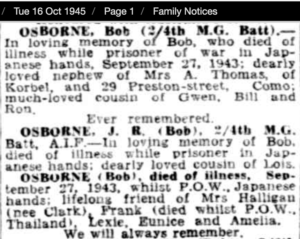 Bob Osborne’ names is included on the Merredin WW2 War Memorial. John’s parents John Osborne and Alice Aldrich were born Victoria and married Daylesford, Victoria in 1914. It is not known when John and Alice moved to WA. John was the eldest born at Bruce Rock. He had one sister Ailsa and three brothers William Thomas, Allan Stanley, Raymond James. The family remained living at Bruce Rock. John Osborne (Snr) died at Belka (Bruce Rock area) in 1949 aged of 70 years. Alice Osborne died in 1966 aged 78 years. They are both buried at Bruce Rock cemetery. A younger brother of Alice, Harold Edward Aldrich born in 1901 Victoria, enlisted WW2 at Toowoomba, Qld, died aged 44 years, 26 July 1945 at Singapore and was buried at Kranji War Cemetery. John Thomas Aldrich died 17 January 1917 at the Somme, and buried at Picardie, France. William Allen Aldrich died 4 July 1918 at Strazeelz near the Belgium Border. 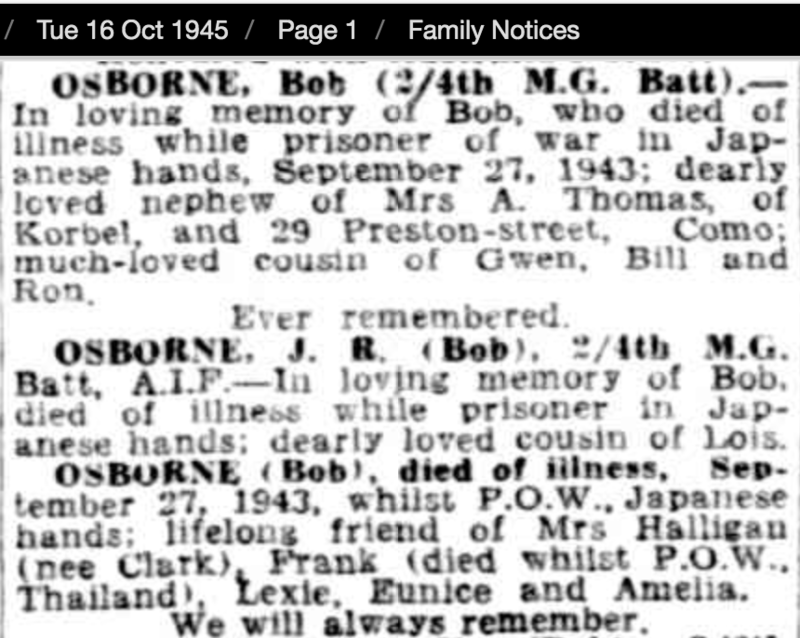 For Alice to endure the death of her first born son, John Robert Osborne at Singapore must have been unbearable. Her husband John Osborne died in 1949. Her father James Grant Aldrich died Ballarat, Victoria two years previously, in 1947.